Strapping on crampons and readying their ice axes, the Jenny Lake Climbing Rangers prepare to embark on an important backcountry mission. But this time, they’re not rescuing an injured climber. Instead, they’re assisting Grand Teton National Park’s scientific research team in a race to determine what’s happening to the park’s glaciers in the face of climate change. 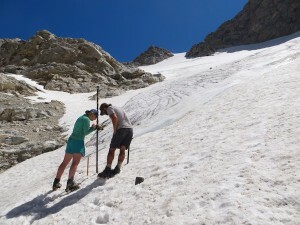 Emily Baker and James Kardouni, seasonal glacier monitoring staff for Grand Teton National Park, surveying reference points on Middle Teton Glacier. Photo by Brent Blankley/NPS. Using GPS units mounted on poles, they take measurements to track the glaciers’ movements. While the park boasts 12 named glaciers, this project focuses on the Middle Teton, Schoolroom, and Petersen glaciers, selected in part because they are relatively easy for researchers to access. On-ice measurements of others were nixed due to safety concerns, but the team is still collecting data on those via time-lapse cameras. The park is still in the early stages of the glacier monitoring project, but project lead Kathryn Mellander, GIS specialist and hydrologist at Grand Teton National Park, notes recent studies documenting an overall loss of approximately 25 percent from 1967 to 2006. “There’s no doubt that they are shrinking, and quickly,” says Mellander. These melting glaciers are just one of the many impacts climate change is already having on national parks. As time goes on these effects will increase and managers are racing not only to address the present-day impacts, but also to forecast future changes. They also the daunting task of figuring out how to manage parks in the face of climate change in order to protect resources, provide visitor services, and meet the dynamic challenges to come. While park visitors want to leave the park with memories and photos, scientists seek a different take-home from their park outings: data. 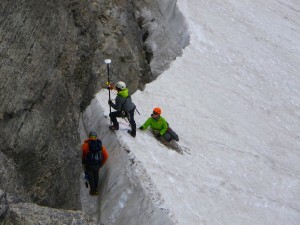 In 2014, the Grand Teton team collected 1,200 data points on the Schoolroom Glacier, and Mellander estimates they recorded about 400 data points on the Middle Teton Glacier in 2015. Every year or two, they re-measure the elevation points to see if a glacier is accumulating or losing ice. They chart the temperature, volume, and surface elevation of the glaciers; map the terminal lower margins; and use several photo monitoring strategies, including aerial and satellite imagery as well as fixed photo monitoring points, to track changes. 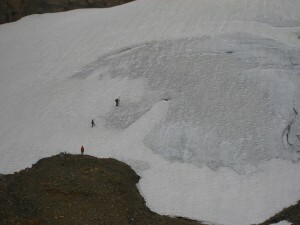 Idaho State University master’s student Hazel Reynolds compared aerial and satellite images of seven park glaciers taken between 1956 and 2010 and found they were retreating during that time period, while Jake Edmunds from the University of Wyoming, noted Teepe Glacier lost 60 percent of its area between 1967 and 2006. He also said summer temperatures were significantly higher during that time compared with an earlier period, 1911 to 1967. And that’s bad news for glaciers and surrounding ecosystems. Jenny Lake Rangers surveying the lower reaches of Schoolroom Glacier in 2014. Photo by Kathy Mellander/NPS. Except for Teton Glacier, the park’s 12 glaciers are all less than a square kilometer apiece, and they are particularly susceptible to the effects of a changing climate. But despite their small size, Teton glaciers have vital impacts on the surrounding ecosystem. “They do have some effect on stream temperatures and they do feed very interesting and rare terrestrial ecosystems, including alpine wetlands, and those exist only because of those glaciers right now,” says Mellander. As Grand Teton’s glaciers are shrinking, other parks also face a variety of physical effects from climate change. Mount Rainier’s glaciers are also receding, rising sea levels and intensifying storms eat away at Assateague Island National Seashore, and interior Alaska faces an array of challenges, including melting glaciers, degrading permafrost, the spread of woody vegetation to new areas, and shrinking boreal ponds and wetlands. One of these projects focused on pikas, a high-elevation “indicator species,” an animal whose condition lets scientists know about the health of the surrounding environment. The Pikas in Peril project studied these creatures, which are the smallest member of the rabbit family, during a three-year endeavor that stretched across eight different NPS units. Their conclusion? Pikas are likely to disappear from several parks in the coming decades but have a good chance of survival in others, such as Grand Teton, where well connected expanses of high-elevation talus habitat will persist. Understanding which parks can provide refuge from climate change can help agencies like the NPS develop conservation strategies. 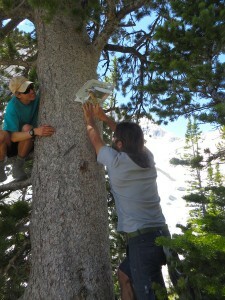 Oliver Scofield and James Kardouni, seasonal staff, installing a high elevation temperature logger. Photo by Emily Baker/NPS. Another vulnerability assessment focused on Dall sheep, another high-alpine indicator species that specializes in finding food and safety along steep, rocky ledges. As climate change alters where plants can live and which species grow where, the sheep may have to follow the food to survive, changing their habitat and patterns. Extreme weather patterns, such as strong variability in snowfall and ice cover, may make it even more difficult for the sheep to find the habitat they need. When visitors head to iconic national parks hoping to glimpse a Dall sheep on a cliff or spy a pika on a talus slope, they will likely be disappointed if they don’t see these animals, which may not be as plentiful or as visible as they were in prior years. While certain animals may be hard to see, one creature will likely be even more plentiful in parks in the coming years: humans. In 2014, over 292 million people visited the national parks, up from 273 million in 2013. In 2015, Yellowstone National Park reported over three million visitors during the first eight months of the year, breaking previous records. The highest percentage of increase wasn’t during the typically packed summer months—it was during the usually less crowded spring shoulder season. The park saw a 48 percent increase in April of 2015 alone, with 46,600 visitors compared to just 31,356 the previous April. With the Centennial of the National Park Service in 2016, park managers are working to learn how climate change will impact parks and visitation patterns. G. R. Fletcher (with pole) and Molly Tyson (belaying), both Jenny Lake Rangers, with Jeff Orlowski, CSU graduate student, surveying the top of Schoolroom Glacier in 2014. Photo by Kathy Mellander/NPS. Fisichelli projects that for 280 out of the 340 park units, visitation will follow temperature patterns and increase in coming years if current climate predictions hold true“This shows the potential for more visitors and longer peak visitor use seasons,” says Fisichelli. He found that a two- to four-week extension of the heavy visitor use season may occur at many parks. Northern parks, such as Acadia, Glacier, Yellowstone, and Rocky Mountain, are most likely to have the largest increases in visitor numbers, according to Fisichelli. Warmer units, such as Arches in Utah, could see more visitors flock to the area in spring and fall as peak summer months become less comfortable, essentially creating two heavy-use “shoulder seasons” with a less busy mid-summer period in between. Tropical and subtropical parks, such as those in Hawaii, aren’t expected to see much change in visitation, as their moderate temperatures are fairly consistent throughout the year. A longer and warmer peak season for many parks could cause difficulties with facility use, maintenance, and staffing, and some affected parks may need to add more potable water and air conditioning in buildings during the potentially longer and hotter summer season. Another option may be to shift activities, such as ranger-led hikes and even ranger maintenance duties, to cooler times of the day. But it’s not just the parks themselves that may see increased visitation. Gateway communities, those within 60 miles of parks, will likely benefit from more visitors staying longer. This could be an economic boon as visitors pack hotels, fuel vehicles, purchase last-minute supplies, and gobble burgers, beer, and ice cream cones—visitors spent over $14.6 billion in gateway communities in 2013 alone. 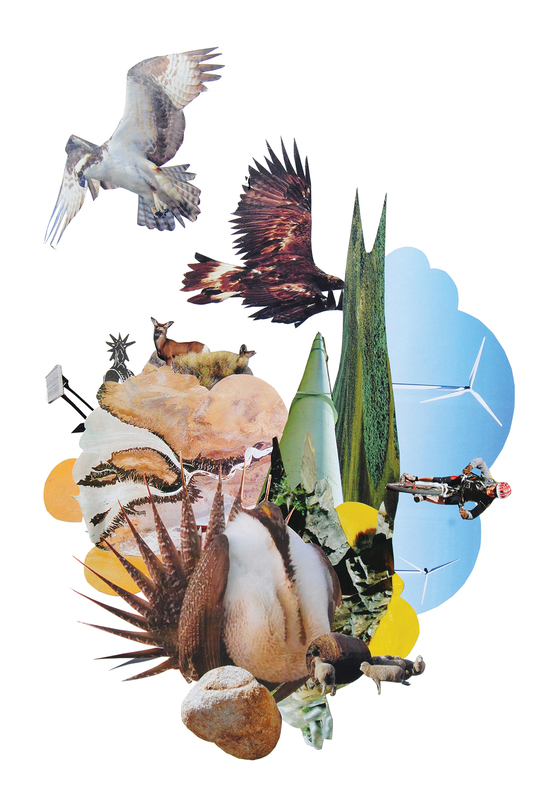 As part of that process, the NPS created a cross-disciplinary Climate Change Response Strategy in 2010. A team of NPS staff makes up the Climate Change Response Program (CCRP) that implements this strategy, which emphasizes four important pillars of addressing climate change in the parks: science, adaptation, greenhouse gas mitigation, and communication. 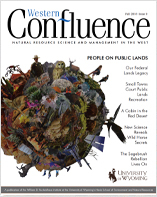 “We’re working to build climate literacy into all levels of our workforce and incorporate it into many aspects of communication from the topics discussed with a ranger on a trail to the manner in which we build and maintain facilities in parks,” says Larry Perez, communications coordinator with NPS’s Climate Change Response Program. As parks change by the day, the NPS is striving to meet the challenges of a changing climate. While the CCRP focuses on bringing climate change issues to the forefront, parks also face budget realities that compound these challenges. If more visitors come for a longer period of time, “That could have some major implications for park management, thinking about staffing, how long you have to keep roads and buildings open, and how long you keep some seasonal staff on at a park,” says Fisichelli. Some of these seasonal staff are the people who teach visitors about climate change. While it is difficult to predict exactly what will happen in any given park at any given time with the dynamic nature of climate change, it’s important for managers to adapt quickly to rapidly changing systems. “That’s really a challenge for managers to steward resources under continuous change,” says Fisichelli. Kristen Pope is a freelance writer and editor who specializes in science and conservation topics and lives in Jackson, Wyoming. Find more of her work at kepope.com.